Frank Money. 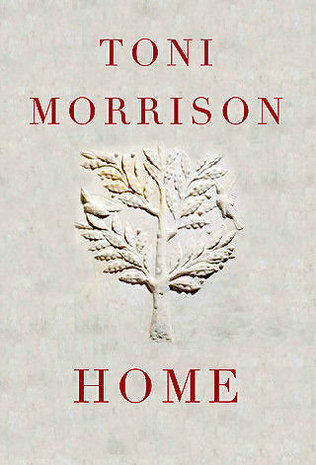 I can’t think of a better, more ironic, name for the hero of Toni Morrison’s new novel, Home. In only 148 short pages (somehow I picture Toni Morrison on that old game show Name that Tune proudly declaring, “I can name that tune in zero notes!” like she could divine what the song will be; and she herself does not waste a single note, syllable or word when she composes) she takes us Home – to an emotionally and psychologically damaged Korean war vet trying to find his way back to Georgia to rescue his little sister from some deep trouble. More so than any past novels, this one is about as straightforward and accessible as a Morrisonian narrative can get, though there’s a brilliant little conceit where between chapters Frank Money is speaking directly to Morrison and reveals some gut-wrenching secrets. It could be argued this is the defining theme of the novel. When marginalized by society, it’s hard to be a man – it’s hard to be free when everything shackles you. Morrison’s novel opens with a prelude describing a childhood memory of Frank’s where he and his sister, Cee, once witnessed stallions duking it out in a wide open field and how Frank recalls the horses as, “…so beautiful. So brutal. And they stood like men.” (pg 5) But it’s that clouded fantasy vision of the horses that overshadows the real horrors witnessed that day…the cold burial of a nameless man in a ditch (are we to assume the victim of a lynching?) In typical Morrisonian fashion, things come full circle in the end, where a deeply heartfelt and symbolical act is carried out to restore that dead man’s legacy. Reading a Toni Morrison novel is akin to experiencing an exorcism – but not a silly, cinematic head-spinning, vomit-spewing exorcism. No, instead think of it like “I had no idea people lived or thought like that but what a great KNOWING has now conjured itself through their trials and tribulations” kind of exorcism – you know, like a quasi- Buddhist “out of great suffering comes enlightenment” kind of thing. And there’s no writer who casts this kind of spell better than Toni Morrison. And don’t be afraid…don’t think that because of who she is she’s only concerned with a narrow view of very trifling folks that someone of her stature would under normal circumstances look down on or scold (much like the character Lenore does to everyone around her in Home) – don’t be afraid she’s going to limit you or her characters or our shared experiences. No – she’s concerned with something so much grander – the great patchwork of humanity – something decidedly and hauntingly democratic and striving to be free. No Morrison novel is complete without a new riff on her old theme, and a wise old woman named Ethel is the one to voice it in Home. Morrison keeps telling us over and over in her works that “You are your own best thing.” Well, it’s no lip-service, friends, and as long as she lives and breathes, Morrison is America’s own best thing. You’d be a fool not to listen to her. And in listening, maybe she’ll help you just a little bit in knowing yourself. This entry was posted in Book Reviews, Books, Language, Literature and tagged Frank Money, Georgia, Home, Lotus, Nobel Laureates, Novels, PTSD, Pulitzer Prize Winning Authors, The Korean War, Toni Morrison. Toni Morrison is the kind of novelist who sears you, leaves scars on the reader. That was the case w Beloved. Beautiful scars left reading that novel several times. There’s a sacredness too about her prose. Beloved took you to the altar and asked if everyone was willing to live into reconciliation in the worst of racial violence. I do have her latest Home on my Kindle for the last few weeks. Don’t know if I’m up to the beautiful scars and the questions that are sacred today. Maybe tomorrow.